TULSA, Okla. — Brogan Spears and her husband, both public school teachers here in Tulsa, don’t expect to start a family in the next decade — but it’s not because they don’t want children. They just can’t afford it. Spears, 25, said she loves teaching, despite the poor pay that leaves her eating crackers for lunch or taking money out of her savings to buy groceries. But the small number in their bank account is making Spears and her husband ask a difficult question considered by many teachers around the country: Can they afford to work in education? Today Spears brings home slightly more than $2,100 a month from teaching in Oklahoma and, like many teachers, she has taken on additional jobs to make up the income gap. But she worries that it affects her ability as an educator. These are just a few of the reasons she and many other Oklahoma public school educators have felt compelled to abandon their classes and march on the statehouse in recent days. These long-term struggles have made the profession difficult for current teachers and unattractive to those who might choose it as a career. And many across the country have taken up the mantle to push the conversation forward in state legislatures. 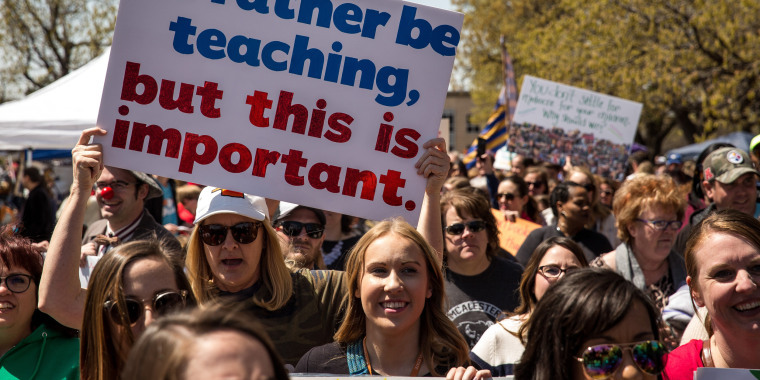 Teachers in Kentucky, Arizona, West Virginia and Oklahoma have already taken to the streets, and educators in other states are beginning to pursue similar organizing tactics — all because trying to make a living in their chosen profession has become a near-impossible challenge. “We’re at the nadir for the teaching profession,” said Linda Darling-Hammond, the president and CEO of the Learning Policy Institute and professor emeritus at Stanford University. Darling-Hammond said that prospects for the profession haven’t been this low since the 1980s, and she explained that much of the work to rebuild it has been steadily dismantled by state governments, led by both Republicans and Democrats, since the late 1990s. GOP administrations have been quicker to cut and slower to reintroduce funding, she added. As a result, teachers earn about 30 percent less than other educated workers, and the attrition rate for the profession in the United States is twice that of most Western countries, according to an August 2017 study by the Learning Policy Institute. And that decline has been steady since the recession began in 2007, causing some state legislators to pay new attention to their education budgets. Times have changed, Ahlquist said, and the country is now close to full employment. However, expectations of public sector employees have stayed the same and they have seen no wage increases to compensate them. State education budgets throughout the country have steadily decreased since 2008, according to the Center on Budget and Policy Priorities. That leaves teachers to continue to suffer financially and professionally. Meanwhile, experts add that state oversight of schools is growing and teachers say their pay is increasingly tied to state testing performance. Teachers across the country cited accountability pressures, a lack of administrative support, and a dissatisfaction with the career and working conditions to be the reason many of them have decided to quit. And prospective teachers have taken notice, as the number of new teachers continues to dwindle. “It’s hard to become a teacher because there’s no money to help you get through school so you’ll have to take on loans, you’re going to earn less and — if you come in without the training — you’re not likely to survive,” said Darling-Hammond. That might be one reason why the number of people pursuing the teaching profession has plummeted. Enrollment in teacher preparation programs nationwide dropped 39 percent from 2010 to 2014 — from more than 680,000 people for the 2010-11 academic year to fewer than 420,000 for the 2014-15 academic year. Interest in Teach for America dwindled in recent years as well, as their application pool fell from 57,000 in 2013 to 37,000 in 2016. That then caused the program to shrink overall, dropping from 5,800 Teach for America educators in 2014 to 3,500 in 2017. There’s a critical teacher shortage in the Mississippi Delta, one of the poorest regions in the nation, but education leaders say that the entire state faces high turnover and low retention, as well as shrinking recruiting classes. The Mississippi Department of Education found that more than a quarter of its school districts suffer from a critical teacher shortage. To try to rectify the situation, the state has attempted to circumvent teacher licensing or lower standards. A recent proposal in the statehouse would have allowed teaching candidates who only scored an 18 on the ACT, which has a max score of 36, and earned a 2.75 GPA in the subject area they want to teach. That bill died in committee. It’s a tactic some states have taken up, and that unwillingness to pay for an academically proven workforce has their teachers running for the border. “Mississippi is not that big across, so you can live in the center and drive a distance to get paid more money,” she added. And there’s data to support the idea that the prospect of a pay increase helps keep teachers in classrooms. According to the Learning Policy Institute study, districts where teachers could expect to one day earn around $78,000 had a turnover rate that was 31 percent lower than those districts where salaries maxed out at less than $60,000. Ten years ago, she said, her rural school district in Indiana would receive more than 200 applications for an open position. Now teaching posts at her schools remain empty indefinitely as people leave the career field and young people aren’t inspired by the job prospects. Melanie Bencosme and Brock Stoneham reported from Oklahoma. Phil McCausland and Daniel Arkin reported from New York. Posted in Advocacy, Educators Protest, Pension & Salary and tagged "Standing Strong for Public Education", #iBelieve, Accountability, Accountability System, Advocacy, Department of Education, Diversity, Education, Education Funding, English Language Learners, Equity, Every Student Succeeds Act (ESSA), Failing, Failing Schools, Federal Education Policy, High-Needs Students, NEAExecutiveCommittee, Pension, Pensions, Public Education, School Choice, Students, Testing and Accountability. Bookmark the permalink.